Geyser insulation can save money and energy. So much energy is wasted through heat loss in a geyser. Geysers outside the house are exposed to cold temperatures, which requires more energy to heat the geyser. While the geyser is on, heat will escape through the geyser’s surface, requiring more energy to make up for this heat loss. Your electricity bill at the end of a cold month may leave you shocked, and the reason lies with your geyser. How can you prevent this heat loss and avoid those nasty end-of-month payments? 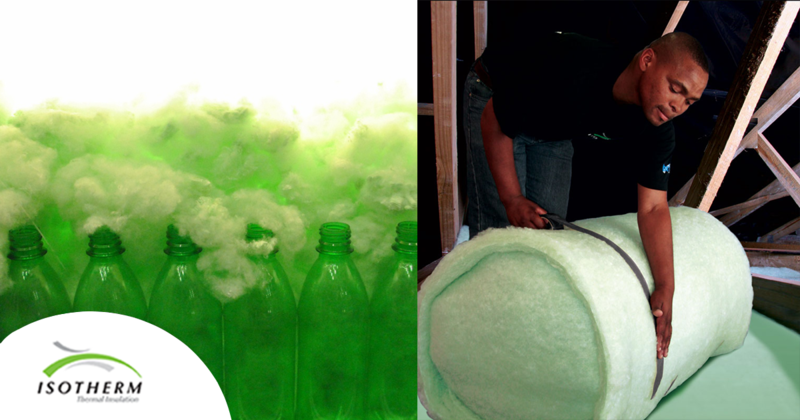 ISOTHERM manufactures insulation products for walls, roofs, geysers and hot water pipes, using recycled PET bottles. This environmentally friendly product comes in the form of non-toxic thermally-bonded polyester, which can be bought by the roll. ISOTHERM is supplied in 750mm and 1200mm wide rolls, and can be easily torn or cut with kitchen scissors to fit your geyser. Once installed, it can save as much as 21% on monthly electricity costs. When also installed in walls, ISOTHERM reduces energy usage by 40 to 70%. Step 1: Measure the area you wish to insulate and cut the required size from a roll of ISOTHERM. Step 2: Fit the ISOTHERM piece around your geyser and secure it in place with duct tape. Make sure the surface of the geyser is snuggly and completely covered by the material. Step 3: Measure the diameter of the circular sides of your geyser and cut these measurements from the ISOTHERM roll. When in doubt, make the circles slightly bigger than what you measured, as the excess can be folded over the flat layer of insulation you applied in Step 2. Step 4: Secure these circles to the sides of your geyser using glue or duct tape again. Step 5: Cut long strips of ISOTHERM or use off-cuts from the circles and wrap it around the pipes connected to the geyser. Use duct tape to secure them in place. Step 6: Make sure the entire geyser structure and all connecting pipes are completely covered with ISOTHERM, and that it is securely attached. Why should you choose ISOTHERM geyser insulation? The benefits of ISOTHERM geyser insulation are extensive. You can save money, time, effort and the environment by using this innovative product. ISOTHERM is a long-lasting investment that will save energy and money by reducing the need for temperature-regulating appliances. The polyester rolls are non-allergenic, non-irritant and non-toxic. They are resilient and reduce the risk of fire since they do not allow the spread of flame and will not smoulder. Protective gear is not necessary during installation as it is a completely safe product. ISOTHERM also provides a safer alternative to hazardous asbestos isolation. The rolls are easy to spread out and can be cut to specific size requirements. The installation is very simple and can be handled by any geyser insulation, builders or by our own installers. Unlike asbestos and other fibrous insulation sheets, ISOTHERM has no loose fibres and is soft and pleasant to the touch, making is easy to handle. ISOTHERM will not collapse as it retains its structure over time. It is also resistant to condensation and the fungi and bacteria that result from damp conditions. Recycled from PET plastic bottles, ISOTHERM is a thermally-bonded polyester that is friendly to both people and the environment. The product itself is also recyclable. The insulation will also help save energy by reducing the use of heaters and air coolers. Our manufacturers are in compliance with recognized quality standards, such as the South African Bureau of Standards (SABS), and proof of qualitative associations with TIASA and others. ISOTHERM is also Agrément certified, one of the highest quality standards worldwide, and have earned ISO 9001 accreditation. It also complies with SANS 10400, the application of the national building regulations, as an insulation material. If you are dreading the electricity bill at the end of every month, ISOTHERM is the product that can put your worries to rest. Save yourself the stress and bring the energy waste down, while supporting the environment.